Nanny's Place a toute la commodité d'une maison moderne nichée dans un cadre de village côté plage. Nos invités apprécient tout ce que le village a à offrir, y compris les boutiques, les magasins, les restaurants et les galeries à une courte promenade. Ils apprécient les meilleurs couchers de soleil au Canada (selon National Geographic) et la rivière Bayfield abrite une pêcherie commerciale (avec un nouveau marché de poissons au lac) et une collection de yachts de luxe en constante évolution. La plage de Bayfield est désignée par le drapeau bleu pour sa qualité et sa sécurité environnementales. Il y a beaucoup à découvrir dans le comté de Huron, y compris Goderich (l'une des villes les plus jolies au Canada), les théâtres d'été populaires et certains terrains de golf exceptionnels, à une courte distance en voiture. Bayfield est coloré en automne et beau en hiver, ce qui en fait une véritable quatre saison s'éloigne. Nanny's Place est familial avec de nombreuses commodités pour accueillir les clients de tous âges. Very nice. Plenty of room for the five of us. Great deck. Perfect Spot - Could not have asked for more! My husband, son and I stayed at Nanny's Place for an extended period while we visited family and friends in the area. We could not have had a better place to call our 'home away from home' during our stay. Nanny's Place had everything (and more!) that we needed. We would definitely recommend to others and would stay again. Thanks for sharing Nanny's Place with us! Lovely home. Well appointed. Excellent location. Unfortunately it was a VERY hot week and we found the back deck too hot to use! It was wonderful to have access to bikes for both adults and youngsters. We would return. Nanny's Place Gave Us The Best Family Vacation Yet! The more time we spend in Bayfield, the better the experience gets. This year, we stayed at Nanny's Place, and it was by far the best cottage yet! We have 4 children (7, 5, 3 and 10 weeks old) and it never felt cramped once with it's open concept layout. The quality and condition of the cottage was a 10/10. The bedrooms were all very large and incredibly well decorated. Although we had 3 large bedrooms to use, all 3 of our children took advantage of the kids bunk beds with slide out 3rd bed. The large, private backyard proved to be very handy when chasing each other with water guns. Thank gawd there were a ton of large tree's providing great shade to the cottage as the week we were there proved to be one of the hottest weeks of the summer. (if you're susceptible to heat, you may want to bring an extra fan or 2). 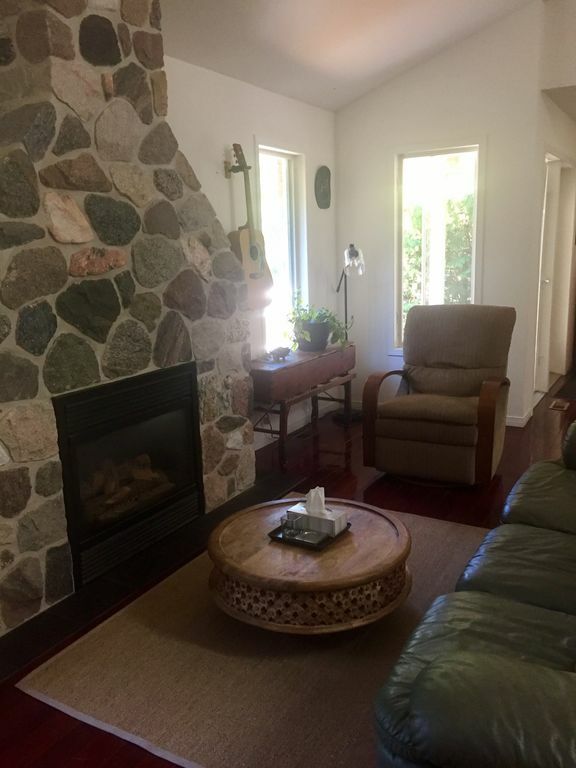 Nanny's Place was beautifully located in the town of Bayfield. Walking distance to the park, downtown and an incredible private beach, we never felt the urge to drive. Bayfield is a great town for a young family, with a lot of fun things to do, art camps to participate in, and a unique culture all to it's own. Quiet, peaceful retreat close a stunning beach and beautiful historic village. We spent a blissful week at Nanny's place in Bayfield. The cottage is bright, modern, impeccably clean, nicely decorated and with all the amenities you could want. We enjoyed morning coffee on the quiet back deck and ended our day with a glass of wine In the same place. The spectacular beach was a short five minute walk and never crowded or noisy. in the mornings have the beach to yourself! The Main Street is far enough away for a quiet stay but close enough to walk to a delicious lunch or dinner out. Nanny's place has all, location, comfort and the peace you crave on vacation. We will be rebooking next year! Until confirmed, rates are subject to change without notice. Linens are not provided but can be arranged for an additional fee.